We are offering a staggering 25% off the listed self-catered price for any bookings confirmed before 1 December. To confirm the booking all we require is a 10% deposit and the remaining balance 6 weeks before your arrival date. From winter 2016 we will be exclusively 'popping up' in a beautiful chalet in the heart of Courchevel 1650, offering catered Chalet Holidays for groups of up to ten people, providing a bespoke fully catered service, offering everything from beautifully presented four course meals to show stopping afternoon teas that'll have even Mary Berry scrambling for her ski pass! Jimmy Garcia and his team have been creating unique dining experiences and bespoke holidays in the Alps for over 10 years. Our dedicated Chalet Host and Chef will welcome you to the slopes with a hot glass of mulled wine whilst our in house boot fitting rental team come to the chalet to arrange your skis whilst you rest up on the couch and soak up the incredible surroundings. Chalet Mollard is a comfortable, well furnished 5 bedroom, 4 bathroom chalet in the old village of popular Courchevel 1650, within minutes walking distance from the ski lifts, shops and restaurants. Following recent renovations throughout, the chalet offers cosy, home-from-home accommodation, furnished with high quality furniture, such as the large linen covered sofas where you can sit back and relax in front of the wood-burning stove, extremely comfortable beds for a very important good night’s sleep and adequate bath and shower rooms for a group of 10 guests. The chalet is set back from the main road in a quiet location, but within a short 3-4 minute walk to the ski lifts, shops and restaurants in Courchevel 1650. 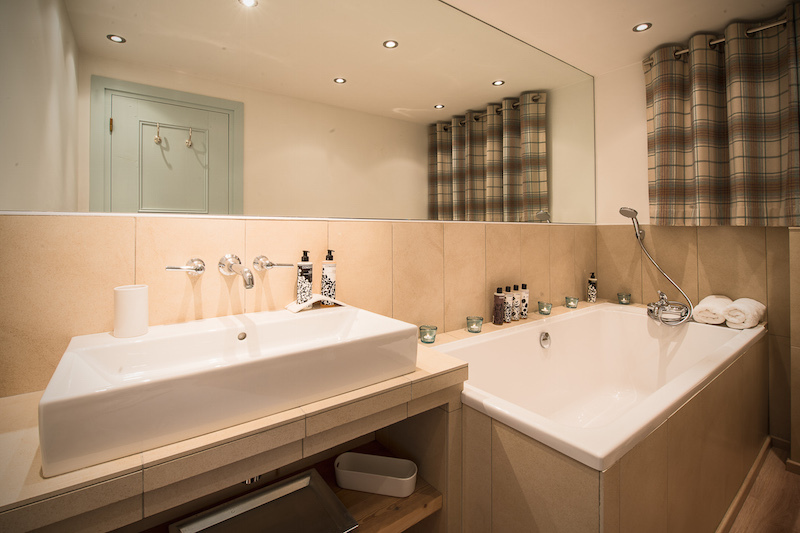 The chalet has been carefully designed with the sleeping accommodation occupying both top and lower ground floors, whilst the living/entertaining space and kitchen sits in-between on the ground floor. Separate to the main entrance, there is lower ground access directly in to a boot room with underfloor heating and a boot warmer. There are stunning views to enjoy across the valleys from one of the three balconies, one of which boasts an outdoor Nordic style wooden hot tub.